Arm workouts have long been a source of men’s attention and research. Why? Because when you wear a short sleeve shirt, there’s nothing cooler than stretching out the sleeves and knowing your epic biceps are being eyed by women and envied by men everywhere you go. Getting your biceps to do this though, is a whole ‘nother trick in itself. While everyone’s body responds differently to training, especially the arms and biceps, I’ve found that high volume is the key to growth for me. I am consistently chasing “the pump” – especially the one where your skin feels like it’s going to burst due to the insane amount of blood being forced into your muscle cells. That’s the ultimate goal. I’ve also taken a page from CT Fletcher’s book and have been training biceps almost every day. CT Fletcher has mentioned several times that when he was first training, he wanted giant arms. To reach his goal he trained arms every single day. CT doesn’t believe in over training and honestly, neither do I – anymore. After just two weeks of training biceps just about every day, I successfully added a 1/4″ to each arm. Now, I didn’t have the time to train triceps each day and can only imagine the growth of my arms if I had. Speaking of over-training and my belief that it doesn’t exist – It’s important to keep in mind that since I started training biceps (and calves) every day, I have upped my macro-nutrient intake (macros) to 350-400 grams of protein each day. I am still hitting my other targeted macros and getting close to 500 grams of carbs and over 100 grams of high quality fat each day. These numbers are specific to my personal body composition, metabolism, and goals. Your macros should be custom tailored as well. Keep in mind that simply calculating your macros without understanding the nutrition plan will not bring you the success you are looking for. Definitely download the eBook and get a firm understanding of the nutrition plan before you start changing your current macros around. whenever possible. This is one of my secrets to big arms. Without further adieu, below is the bicep workout that added 1/4″ to my arms in just two weeks. In order for your biceps and arms to grow using this workout, it’s essential that they receive all of the proper nutrients and supplementation. Otherwise, if you aren’t feeding the muscle cells properly, you’re just tearing down muscle fiber with no hope of them regrowing bigger and thicker. 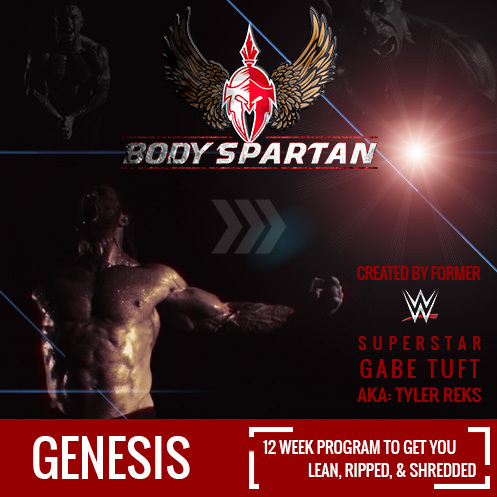 I discuss this in depth in my book, Body Spartan: Genesis, and honestly believe next to protein, this is the most important supplement you can buy. It packs the most bang for your buck and fuels your muscles to continue past the point of fatigue. It’s PH balanced creatine monohydrate which maximizes the amount of water that is forced into your muscle cells and minimizes the amount forced in between the cells and the skin, which gives you the bloated look. Kre-alkalyn gives you more muscular endurance AND a full, hard look all day. This is a supplement that you will want to buy in large quantities. Studies have shown there are no negative side effects of long-term use of creatine. Ergo, there is no need to cycle on and off of this supplement. If you want your biceps to grow, grab some Kre-Alkalyn from the left and use the gauntlet workout. NO2 Black is a high-quality vasodilator which enables more blood flow to reach your muscle cells. You become more vascular and your muscles will be fueled by the additional nutrients and oxygen carried through the blood stream, right to each muscle cell. This means a faster recovery rate, delayed fatigue while lifting, and of course more muscle growth. This is the ONLY protein I use. It’s clean, it’s high quality, and it has virtually no carbohydrates. You can mix it in a shaker cup and it leaves zero chunks of protein floating around. The stuff is awesome. I have two flavors that I like. One is the double chocolate and the other is strawberry., Mix with almond milk for an awesome consistency and flavor. The larger container you buy, the cheaper it is. Since this is THE NUMBER ONE SUPPLEMENT FOR ANY FITNESS PROGRAM, buy the big container every time. Your muscles MUST have protein to grow and rebuild. There is no shortcut around this. If you do this workout properly and daily, I guarantee that you will see noticeable growth in your biceps. It worked for me – even though I’ve had 22 years of experience with fitness and weight lifting. In other words, even though my muscles have been exposed to all sorts of training styles and programs, this specific workout helped my biceps grow a 1/4″ in two weeks. Try this workout for at least four weeks. Then begin incorporating other movements or replacing ones in the workout. For example, you could incorporate alternating dumbbell hammer curls for sets of 15 with a one minute rest. You could also throw in straight bar curls for the initial gauntlet and use the Fat Gripz the whole time. As long as you are mixing up the routine and shocking your body, while using a good amount of volume, you’re going to grow. OK, I had to drop the weights and use 2.5lbs (cause I’m a girl) but oh my gosh that was tough! Best bicep workout I’ve ever tried!